With the second round of the Rugby Championship and the opening weekend of the new Top 14 season to enjoy, competition for places in our latest team of the week was hot! After New Zealand's impressive victory, you won't be surprised to see a whole host of All Blacks in this side, coupled with standout performers from Argentina's triumph in Mendoza. We've also plucked out some of the players that turned heads in the opening round of France's domestic competition, including a pacy flanker and a familiar full-back. Let's start with that familiar full-back, shall we?! 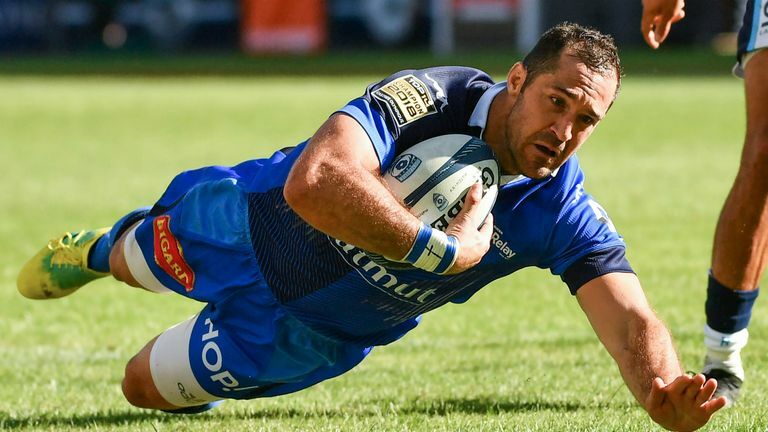 Scott Spedding, the former ASM Clermont Auvergne man, put in a fine all-round performance and had a club debut to remember. In a repeat of last season's Top 14 final, the 32-year-old outshone his opposite number and ignited his side. He ran in two tries and set up another with a beautiful break, chip and collect. But that wasn't all as he finished his debut with a crucial try-saving tackle on Vincent Martin. Spedding's textbook cover tackle, in the 78th minute, was exceptional and ensured that his team held on for victory. 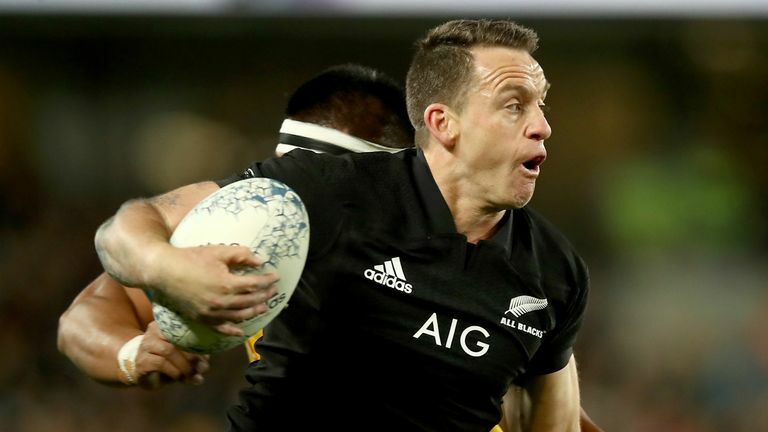 Three words that started Sean Fitzpatrick's assessment of Ben Smith's performance against Australia and we think that our Sky Sports Analyst hit the nail on the head. Smith's aerial skills are sublime and his world-class skill set was showcased throughout as he set up tries in style. He's a player that combines vision and pace with excellent hands and exemplary decision-making and we saw it all at Eden Park. Matías Moroni certainly stepped up for the home side and was instrumental in their victory. The back's powerful running and vision set his side on the right track and he oozed confidence throughout. Moroni delivered three try assists during the 80 minutes as he set up Bautista Delguy, Nicolas Sanchez and Ramiro Moyano and his offload, off the deck, for Sanchez was divine. Ngani Laumape grew into their Bledisloe Cup victory. His hard running and carries really told in the second half as the home side turned the screw against their local rivals. Laumape finished the encounter with 16 carries. He made 81 metres and beat five defenders for good measure too. Sometimes moments of magic push a player into our ranks and the way in which Cheslin Kolbe set up his fellow winger Yoann Huget did that this week. Kolbe collected the ball deep inside his own half, spotted a gap between two defenders and just ripped up the field of play. He left defender, after defender, clutching at thin air and when his break was eventually halted, he calmly delivered the offload that kept the move alive. His team-mates made sure of an epic try, so we're going to be keeping an eye out for more of the same from Kolbe in the forthcoming Top 14 rounds. Beauden Barrett's 80 minutes at Eden Park were a joy to watch and his outing was one of the most-eye catching that we'll see during this year's Rugby Championship. The fly-half made full use of his pack's outstanding work and delivered it all. He did everything that you could want from your play-maker and made it look effortless. A 30-point haul on the international stage isn't achieved by many and the fineness with which he achieved it was something special. Before we move on, a word must be said about the work of Sanchez in Mendoza. After any other weekend, the fly-half's full house - a try, three conversions, a penalty and a drop-goal - would have handed him our 10 jersey. He inspired his side brilliantly but on this occasion Barrett pips him to it. While Aaron Smith was on the field he put the ball on a plate for his half-back partner and for those around him. His service was crisp, clean and accurate and as a result it provided the tempo required for the home side. Away from that, his desire to play for his team shone through when he tracked back and saved a certain Wallaby try at the end of the first quarter. Yes, he missed the tackle on Bernard Foley that led to Reece Hodge's five-pointer but, in context, that was a small blot on his copybook at Eden Park. Steven Kitshoff arrived onto the field after 42 minutes and did exactly what he would have been asked to do - stabilising his side's set piece. Despite his work, and a more positive second half from the visiting side, Rassie Erasmus wasn't a happy man after the Boks' loss. A big response is expected from them in the next round and Kitshoff will be keen to push for a starting spot against Australia. On home soil, Los Pumas' captain led from the front. He ensured that his side converted a promising position in a match into a victory and that can be a very difficult thing to do when results haven't been going your way. Creevy was ever-present as Argentina sorted out their set piece issues from last week. He was accurate with his lineout throws, losing just one, and was pivotal at the heart of their scrum. Juan Figallo joins his captain in our front row after the 30-year-old put in a physical performance and showed the fruits of his considerable experience. His own prowess at the set piece and his desire to give absolutely everything that he has for the cause was there for all to see. A team's energy and confidence often comes from a gutsy scrummaging and Figallo certainly delivered that while he was on the park. New Zealand's lock is in superb form right now and once again stood out for the side ranked No 1 in the world. Five minutes into the match he set the tone for his day. Retallick ripped the ball free from Lukhan Tui, got the offload away and then went on to steal Australia's next lineout. It was a sequence of events that summed up the athletic All Black and his place in this team of the week was never in doubt. 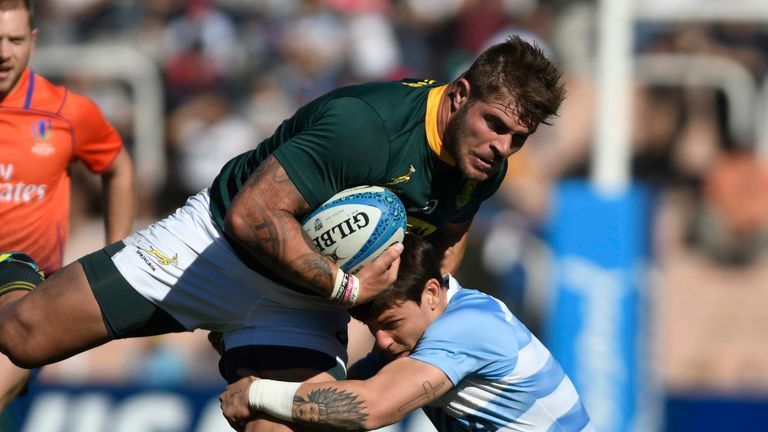 Argentina's victory was only their third win in 28 previous meetings with South Africa and their lock made crucial lineout steals and put himself about defensively. The 23-year-old finished his 80 minutes with 15 tackles to his name and, alongside his team-mates, will be keen to build up on the momentum that a win can stimulate. In Los Pumas' back row, Pablo Matera produced a solid physical performance and combined it with gumption in the loose. A 24th-minute break saw Matera pounce on an opportunity and duly catch the Boks unawares. Meanwhile, on the back foot, his 12 tackles added handsomely to their rearguard effort. Another high-flyer from the opening weekend of the Top 14 season was 23-year-old Sekou Macalou. The flanker showed a winger's pace for his first try - his teammates whipped it wide to him and he turned on the afterburners down the left wing - and a poacher's instinct for his second. Macalou was busy throughout, at the lineout and at the breakdown, alongside finishing the afternoon with 19 tackles to his name. Gutsy in defeat. Australia's No. 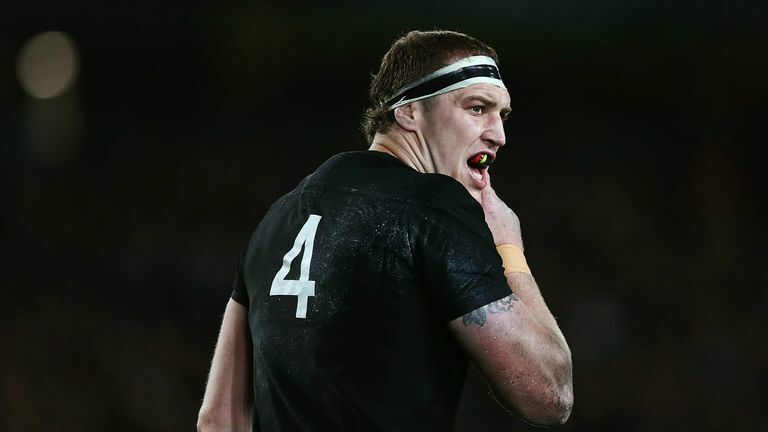 8 gave their encounter with the All Blacks his all and then just a little bit more. Pocock was the Wallabies' top tackler with 18, he missed none, and put in the type of physical intensity that he is famed for. The 30-year-old was disruptive at the breakdown, earned more defensive turnovers than any other Wallaby and, once again, highlighted his incredible work rate.